Should healthcare reform include a public option? That is, even if most people continue to get their healthcare via private insurers, should they have the option of signing up with a public plan if they want to? The argument in favor is fairly simple: it keeps private insurers honest. If the free market really does produce efficiencies and lower costs, then private plans ought to be able to provide medical services for less than the bloated government bureaucracy that runs Medicare. If it turns out they can’t, then they’ll go out of business. The argument against, such as it is, is that a public option will….what? Force doctors to accept lower payment by fiat, I guess. Or compete unfairly in some way. I’m not sure. My own guess is that a public option would be a boon for private insurers. They really don’t want to treat the sickest, costliest patients, after all, and even if they’re required to insure all comers they’ll still do everything they can to avoid taking them on. That’s a whole lot easier if turning the hardest cases away merely means they sign up for Medicare rather than being left to die in the street. It doesn’t matter. 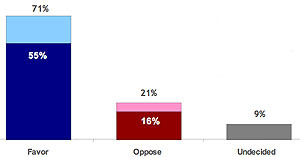 In case after case after case, the public insurance option retains majority support. The bad guys haven’t started up their PR blitz yet, of course, so this could all change. But it’s an encouraging sign.